This drama cake would be perfect for someone who loves the theater (either performing or going to the theater). It would also work great for a cast party or "after party", held after a performance. The one used in this photo was for a 16th birthday party, but it could be used for any teen party or adult party. 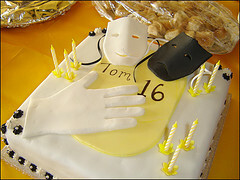 The Greek comedy and tragedy masks and glove on this cake were made of fondant.